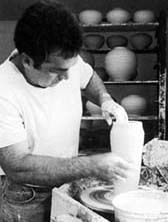 My passion for pottery began in 1983 when I began my study of Ceramic Art in North Carolina. Upon graduation, I returned to Wisconsin to accept a position with one of the nation’s largest producers of handmade pottery. During my 10 years of experience there, I refined my throwing skills and was given the title Master Potter, of which I am honored. Bruce Johnson Clay Studio was founded in 1993. Today I draw from these experiences to design and create Decorative Ceramic Art. The spontaneity of the American Style Raku process allows for the combination of fire, clay and air. Raku represents my desire to provide an interactive and meaning-ful part in others’ lives. The success of this technique is based as much on my intuition as it is on science. . . and since the coloration and patterns come from the action of the flames, no two Raku pots will ever be alike.